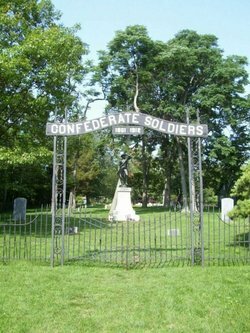 Situated in Ottawa County on little Johnson’s Island, Sandusky Bay, Marblehead, Ohio, this cemetery occupies land donated to the United States in 1931 by the United Daughters of the Confederacy. In 1862 through 1865, the 1.2 acre tract was used as a prison burial ground for Confederate commissioned officers. The prison was primarily for the confinement of Confederate officers although a few enlisted men were also interred in the cemetery. There are 153 known and 52 unknown graves, but the cemetery register shows 246 names, of which 20 were citizens and 22 were later removed. Other records state that there are 206 Confederates buried in the cemetery. A statue was erected by the United Daughters of the Confederacy in 1910. The cemetery is located in Danbury Township, Ottawa County, Ohio. This entry was tagged Confederate Officers Prison, Danbury Township, Johnson's Island Prison, Ohio, Ottawa County. Bookmark the permalink.